This week: This time, I think about the similar demands for exploring a virtual and a real forest. Exploring the nature is one of my favorite hobbies. I like to hike through forests and to reach the peaks of mountains and hills in order to find amazing vantage points. Over time, I have developed a certain situational awareness and visual attention which help me to spot interesting features others might not notice. The desire to explore the nature has also drawn my attention to „The Long Dark“, a survival computer game that takes place in the Canadian wilderness during the winter. 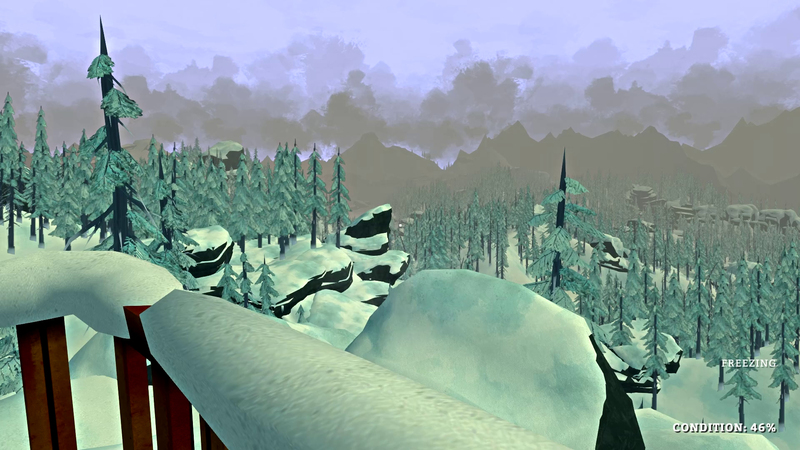 During the gameplay, the players can explore vast regions by walking through forests, climbing on top of mountains and crossing frozen lakes. However, apart from enjoying and exploring the winter landscape, the players also have to survive in this harsh environment. The players are required to find some food, to sleep and to protect their virtual bodies from the freezing temperatures. These survival mechanisms are the core elements of the game and challenge the players to pay attention while they are exploring the environment. This is especially necessary during the first days of the gameplay as the players are only wearing thin clothes and are not prepared to stay outdoors in the freezing temperatures. Discovering a shelter in time can make the difference between dying and surviving. As I was playing the game for the very first time, I was impressed how realistic it felt to walk through the virtual forests. 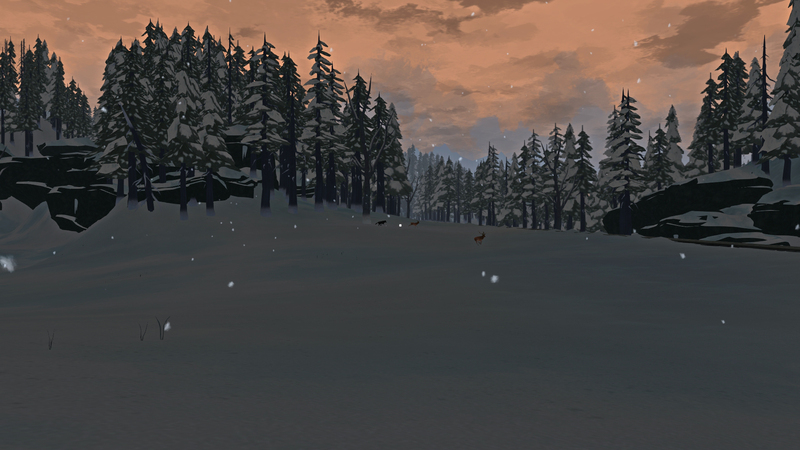 The graphics of the game are a bit abstract, but I had all the time the impression to be out in the nature while I was seeking a shelter to survive the first night. This impression was mostly caused by the colors, the lighting and the sounds of the game. These three elements are also the most noticeable things while being out in the nature. For example, while walking through a forest, most of the trees are just „trees“ and we are not really paying attention to their shape. However, the bright colors of a clearing are easy to spot, hence they draw our attention. As I explored the virtual nature, I also noticed that I moved through this terrain the same way as I do when I hike through the real nature: I analyzed the environment for unnatural anomalies to spot interesting things. My trained situational awareness helped me to successfully play the game, as I was able to transfer some of knowledge from the real world to the game world because the exploration of the virtual nature has similar demands to the exploration of the real nature. 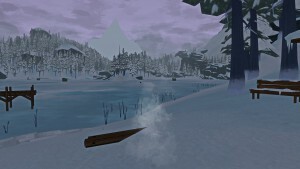 This leads to the hypothesis, that the game can be used to train the situational awareness of players who are not used to walk through the nature and have difficulties to spot interesting features in the environment. If this hypothesis is true, then the game can be used in order to help the players to develop a situational awareness which helps them to recognize more interesting features while walking through the nature. This week: This time, I think about the core game mechanics of a new feature added to World of Warcraft with the expansion pack Warlords of Draenor: the Garrison. The analysis of the Garrison has identified three main segments: buildings, followers and quests. Moreover, the analysis has identified all the game mechanics which are used in order to realize these segments. Buildings: The player can construct several buildings in order to gain access to unique boni. Moreover, the player can upgrade the own buildings to increase their capacity and to gain access to more advanced boni. Finally, he can place work orders in order to transmute materials or resources. 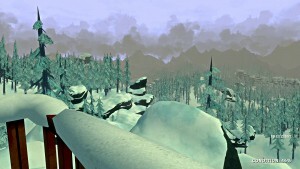 However, the player can not place an endless amount of buildings: the Garrison provides only a limited amount of building slots thus requiring the player to choose between all the different buildings. Utilizing these game mechanics challenges the decision-making and strategic-planning skills of the player. Followers: A follower is a special NPCs who joined the player during his explorations of the WoD regions or who was hired by the player in one of the Garrison buildings. Each follower is characterized by his abilities, his traits and his equipment. The skills allow the follower to perform special tasks and the equipment determines the follower’s performance. 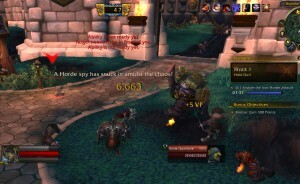 A follower can be assigned to work in one of the Garrison buildings or to fight in one of the special follower missions. Planning such a follower mission challenges the player to analyze the requirements of the mission in order to assign the right followers to it. Utilizing the follower game mechanics challenges the player’s problem-solving and decision-making abilities. Quests: The player can complete three different types of Garrison quests. At first, the player has to visualize the problem of the quest and need to decide what actions he has to take in order to complete the quest. Subsequently, the player has to execute his plan of attack. Mostly, this involves defeating enemies, collecting items or scoring points. In general, solving a quest demands the visualization, decision-making and problem-solving skills of the user. Executing the combat game mechanics of WoW demands the reaction time, the hand-eye-coordination, the decision-making and the spatial navigation abililties of the player. Unbelievable! This is the 100th article of my weekly series about game based learning, game research, computer games and science in general. I can not believe that I am doing this now for almost two years without running out of content! I am really looking forward continuing this series–science and scientific results are just amazing topics. The last three articles analyzed all the game mechanics being used to realize the feature of the Garrison in WoW. However, the presentation of the Garrison is also linked with two core features of WoW: completing quests and defeating evil creatures. The quests are connecting the Garrison to the campaign of WoD and are helping to increase the immersive effect of being part of something big. 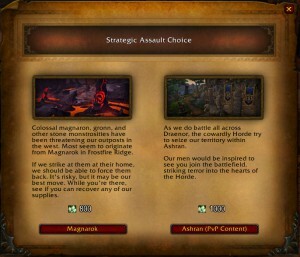 After upgrading the Garrison to level 3, the players gain access to the „Strategic Assault Choice“ (SAC). This feature is basically a quest that can be accepted and completed on a daily basis. 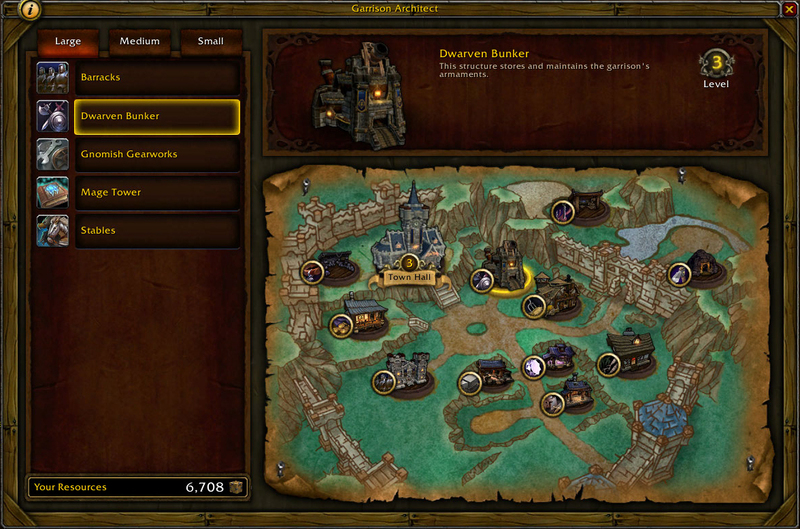 Activating the SAC menu allows the players to choose between two different tasks, sending the players to different regions of WoD with the task to attack a certain enemy. This can be mostly done by just killing enough enemies until the progress bar reaches 100%. Apart from just killing evil creatures, the players can also work towards the completion of the quest by destroying or collecting specific items or freeing captured NPCs. The players are challenged to visualize the problem of the quest and need to decide what actions they need to take in order to complete the quest. This is mostly demanding the visualization, decision-making and problem-solving skills of the players. While fighting against the evil creatures, the players have to react to special attacks and threatening environmental conditions (e.g. fire on the ground). Moreover, the players have to analyze the area, spot potential targets and control the actions of their avatars via keyboard and mouse inputs. This is demanding the reaction time, the hand-eye-coordination, the decision-making and the spatial navigation abililties of the players. Completing these SAC quests can also unlock a Garrison Invasion. This invasion is a special event that takes place inside the player’s Garrison. After having unlocked such an invasion, the players can talk to one of the NPCs standing around in the Garrison and start this special event. Throughout the progression of this invasion, the players get constantly attacked by evil creatures. The presentation of this invasion is also enhanced by the fact that the Garrison guards participate in this battle creating the impression that a huge attack is conducted against the own fortress. During the battle, the players are also able to score some points. The final score of the invasion determines the player’s reward: reaching more than 300 points rewards the players with a first reward, scoring more 600 points results in a better reward and scoring more than 1000 points rewards the players with the best possible reward. Scoring these points is mostly done by killing the attackers. Apart from regular enemies, the Garrison is also attacked by special creatures which are granting more points after being defeated. This challenges the players to keep always an eye on these special events and requires them to focus their attacks on these particular creatures to score well during the invasion. Moreover, the players receive additional points for keeping their Garrisons intact. This challenges the player to also keep an eye on potential enemies who can damage the buildings. The Garrison Invasion is in progress. 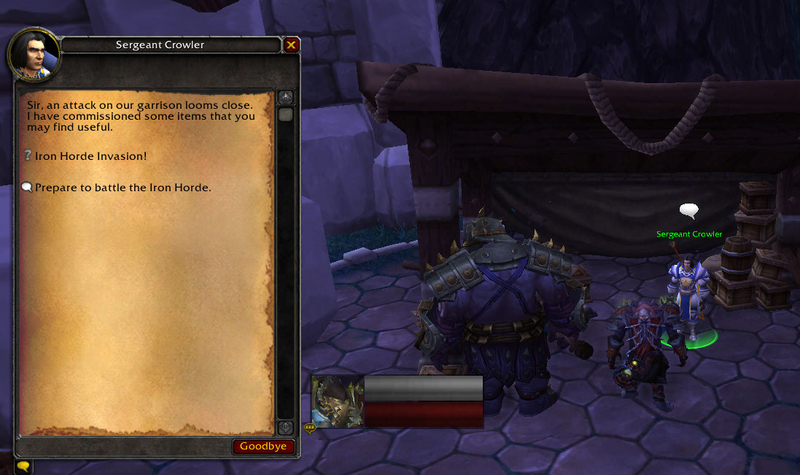 The Garrison Invasion is demanding the same human skills as solving a quest. The players have to identify and locate enemies and pay attention to special attacks. The game mechanic of scoring points results in an increased demand for decision making and reaction time: the players have to react to the occurance of special enemies and have to defeat them in time before the invasion is finished or some damage is caused to a building of the Garrison. The last quest related feature of the Garrison is the so-called „Garrison Campaign“. The Garrison Campaign unlocks over time a series of quests, providing some more background information about all the events of the WoD expansion pack and the presence of the players in the regions of WoD. The demands for solving these quests are exactly the same demands as mentioned in the SAC part. Solving a quest requires the players to visualize and solve a problem. This is then mostly done by defeating enemies which is demanding the identified human abilities. Working towards the completion of a quest. 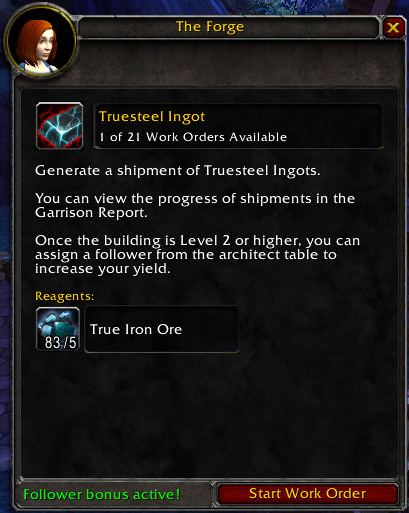 Finally, the Garrison Invasion and all the Garrison related quests can also be completed in a group with other players. In case of forming a group, the game mechanics are also demanding the collaboration and team work skills of the players. Depending on the class of the avatar, the players can sustain more damage, cause more damage or heal other players. This stone-paper-scissors approach is challenging the collaboration skills of the players. Moreover, the player’s Garrison gets attacked from multiple sites and defending it together with other players offers the opportunity to work together and assign one player per front line resulting in a better defense of the Garrison. This is then also demanding a task distribution ability. The amount of construction slots limits the access to the available boni for each building size. 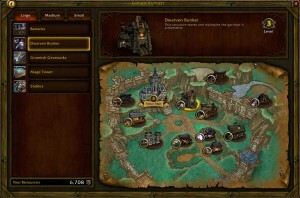 For example, the large buildings offer the following boni: waygates to certain regions of WoD (Mage Tower), increased amount of followers and an NPC bodyguard (Barracks), items to change the visual appearance of the character and a free bonus loot roll per week (Dwarven Bunker), special engineering tools with different functions and a powerful siege engine (Gnomish Gearworks) and a 20% increased mount speed (Stables). The players then have to choose two of these boni by constructing the buildings. The small and the medium buildings are working the same way. The small buildings are mostly granting benefits for the professions of the players or are enabling the players to craft items without having the specific profession. The medium buildings are mostly providing ways of generating certain resources the players need to expand the own Garrison or to enhance their equipment. Three third level small buildings. As a short summary, all these different buildings allow the players to adjust the functionality of the Garrison to support their own playstyle. A player who has a focus on sending the Garrison followers on missions will probably build the Barracks in order to increase the amount of available followers. 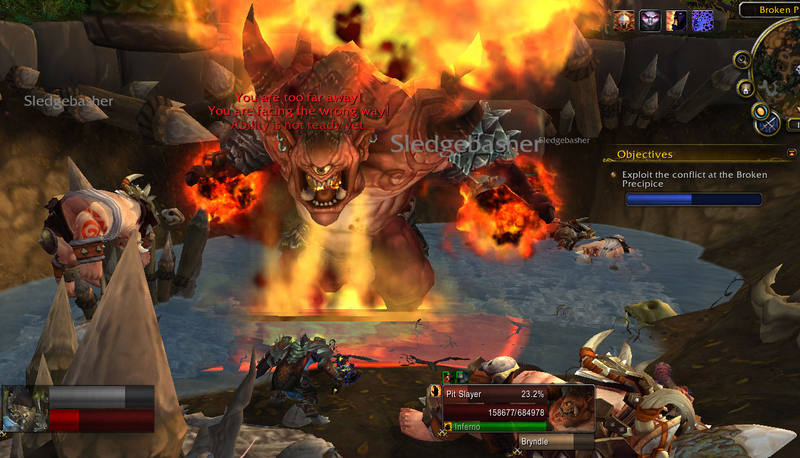 A player who travels a lot on a mount through the regions of WoD will probably build the Stables. The buildings also offer a function to transmute one resource into a different resource. For example, the small profession buildings can transmute raw materials into crafting reagents thus helping the players to accumulate enough reagents to craft a new item. 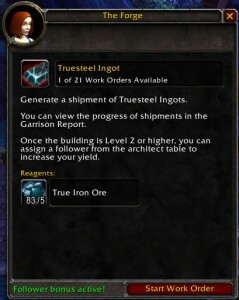 Other buildings are transmuting materials into Garrison resources which are needed to start follower missions, to construct new buildings or to buy other items. The game mechanics of constructing and upgrading buildings is challenging the decision-making and the strategic-planning skills of the players. The players have to analyze their own playstyle and the impact of each bonus on it. Then, the players are able to select and construct the buildings based on this analysis. Moreover, the players are required to plan ahead, because gaining access to the highest building level by upgrading it requires a lot of resources.